Guapinol (Hymenaea courbaril) is excessively hard, heavy, and very strong wood, with a basic specific gravity of 0.71 to 0.91, and air dry density of 52 to 61 pcf (www.arandufloors.com). 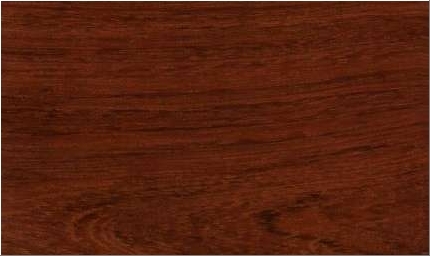 While the sapwood of jatoba is gray-white, the heartwood tends to a salmon-red to orange-brown color when freshly milled, becoming russet or rich deep red color with dark streaks over time. Therefore, the color will change dramatically when seasoned. In direct sunlight, the color change will occur within a few days. Out of sunlight, it will oxidize slowly over 6 months. Water-based finishes tend to retard the color change, while oil-based finishes enhance it (www.exoticwoodflooring.com). With its inherent beauty, rich coloring, and extreme hardness, this species is understandably one of the most popular exotic woods (www.countyfloors.com). The guapinol tree is rare and in danger of extinction due to heavy exploitation. That is reason enough to plant some of these beautiful trees, aside from their high-value wood. Brazilian cherry is prized for its pleasing color, beauty, and durability and is used in fine furniture and cabinetry (sometimes it is compared with mahogany). It is commercially useful for flooring, stair treads, parquet, architectural details, joinery and turnery, and decorative veneers (www.exotichardwood.com). Additionally, it is used for general construction, railroad ties, wheels and cogs, dugouts, shipbuilding, crossties, posts, looms, and cartwheels. Indians made canoes from the smooth, hard, thick bark by stripping in one piece the bark of a large tree, sewing the ends together, waterproofing the seams with gum or resin, and inserting wooden crosspieces (www.hort.purdue.edu). The roots and trunk yield a pale yellow or reddish resin like gum, known commercially as copal. The gum is used mainly in varnish but also for incense and local medicines. Reported to be anodyne, antiseptic, astringent, expectorant, laxative, pectoral, purgative, sedative, stomachic, stimulant, tonic, and vermifuge, the guapinol tree is a folk remedy for arthritis, asthma, beriberi, blenorrhagia, bronchitis, bruises, catarrh, cystitis, diarrhea, dyspepsia, emphysema, fractures, headaches, laryngitis, lungs, malaria, nephritis, rheumatism, sore, spasms, stomatitis, ulcers, and venereal disease, and the bark infusion is used as a depurative stomachic in exanthema; smoke from rosin is used for headaches and rheumatism (Duke, Handbook of Energy Crops). The grain of guapinol is strongly intercrossed; its luster is light, its texture moderately fine to moderately heavy and oily; it is without distinctive odor or taste (Carpio, I. 1992). The Janka side hardness test shows that Brazilian cherry is 228 percent as hard as red oak, with a value of 2350 to 2820 lb, and 19 percent more stable (www.windsorplywood.com). Drying is considered difficult for this wood, and it occurs at moderate to fast speed, with cracks, twists, and slight surface hardening taking place. It is hard to work and difficult to preserve. This wood is known to have a high natural durability. Brazilian cherry specifically ranges from Cuba and Jamaica to Trinidad and Tobago in the West Indies, and from Mexico through Peru, Bolivia, Brazil, and French Guiana. It is reported in almost pure stands in Mexico (Vozzo, J.A, 2002). It is a slow growing, well-formed tree with a clean trunk. It occurs from sea level to about 900 m (2925 feet), and it grows better in well-drained soils with annual rainfall of 1900 mm to 2150 mm. Basically, it is a timber tree reported to grow about 1 m (3.28 feet) per year to about 45 m (147.6 feet) in height and a diameter of 1 m (39.37 in) DBH. In forests, the trunk is smooth, cylindrical, gray brown grayish bark, and modest buttresses. The leaves are bifoliate and alternate. The flowers have a mild, sweet fragrance; they are white or creamy, in rather loose spikes up to 10 cm (3.94 in) long, single or in pairs in the upper leaf corners. Flowers are observed between March and May, and fruits from July to March (Vozzo, J.A, 2002). The seed pods are broad, linear, and irregularly coiled. The pod can contains 3 or 4 seeds encased in a powdery, cream-colored edible pulp with unpleasant flavor, and the seeds are shiny dark brown to black (www.dfsc.dk). The seeds are collected from the ground after the pods fall, which is safe since the pods do not open naturally and also have a protective gum that delays rotting for several months. There have been few experiences in plantations with this species, and seems that it would have intermediate growth, but problems in forming commercial trunks have been reported (Jimenez, Q et al, 2002). Therefore, pruning at the early stage needs to be considered. Carpio, Isabel. Maderas de Costa Rica: 150 especies forestales. 1era Edic. San José, Costa Rica, Edit. Univ. de Costa Rica, 1992. 66. Vozzo, J.A., Hymenaea courbaril L., in Tropical Trees Seed Manual, USDA Forest Service, Agriculture Handbook 721, October 2002. 518-519. Jiménez, Q. et al. Árboles maderables de Costa Rica: Ecología y silvicultura. Editorial Inbio y E. Tecnológica de CR., 2002. 361.